The diffuse cosmic X-ray background (CXB) is the sum of the emission of discrete sources, mostly massive black-holes accreting matter in active galactic nuclei (AGN). The CXB spectrum differs from the integration of the spectra of individual sources, calling for a large population, undetected so far, of strongly obscured Compton thick AGN. Such objects are predicted by unified mod- els, which attribute most of the AGN diversity to their inclination on the line of sight, and play an important role for the understanding of the growth of black holes in the early Universe. The fraction of obscured AGN at low redshift can be derived from the observed CXB spectrum assuming AGN spectral templates and luminosity functions. We show that high signal-to-noise average hard X-ray spectra, derived from more than a billion seconds of effective exposure time with the Swift/BAT instrument, imply that mildly obscured Compton thin AGN feature a strong reflection and contribute massively to the CXB. A population of Compton thick AGN larger than that effectively detected is not required, as no more than 6% of the CXB flux can be attributed to them. The stronger reflection observed in mildly obscured AGN suggests that the covering fraction of the gas and dust surrounding their central engines is a key factor in shaping their appearance. These mildly obscured AGN are easier to study at high redshift than Compton thick sources. 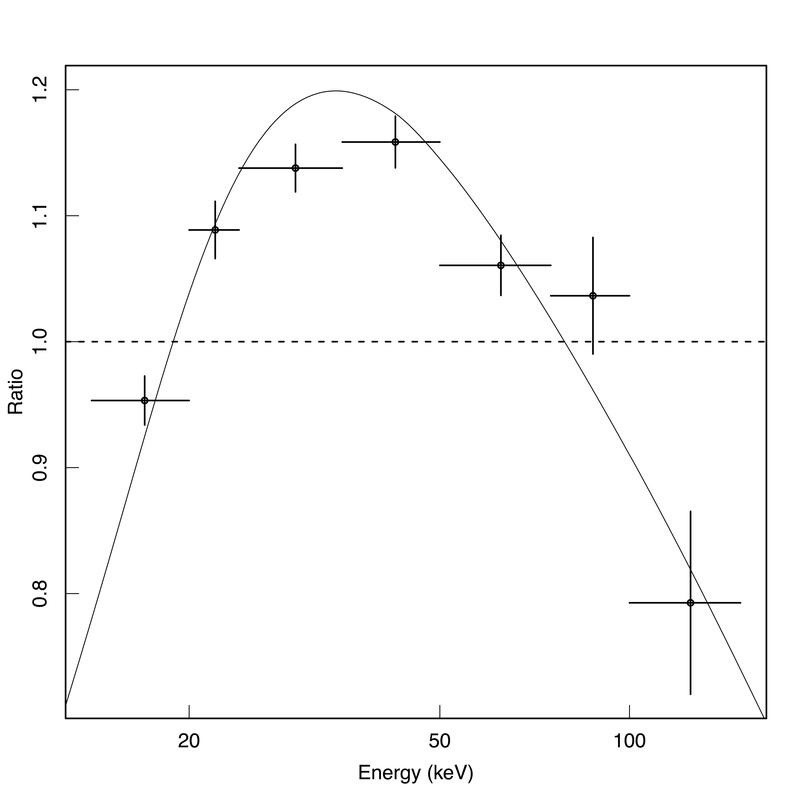 Ratio of the spectra from midly versus lightly obscured Active Galactic Nuclei. The data points have been derived from the stacking of 1 Billion seconds of Swift/BAT exposure time. The curve shows the prediction of a reflection model. 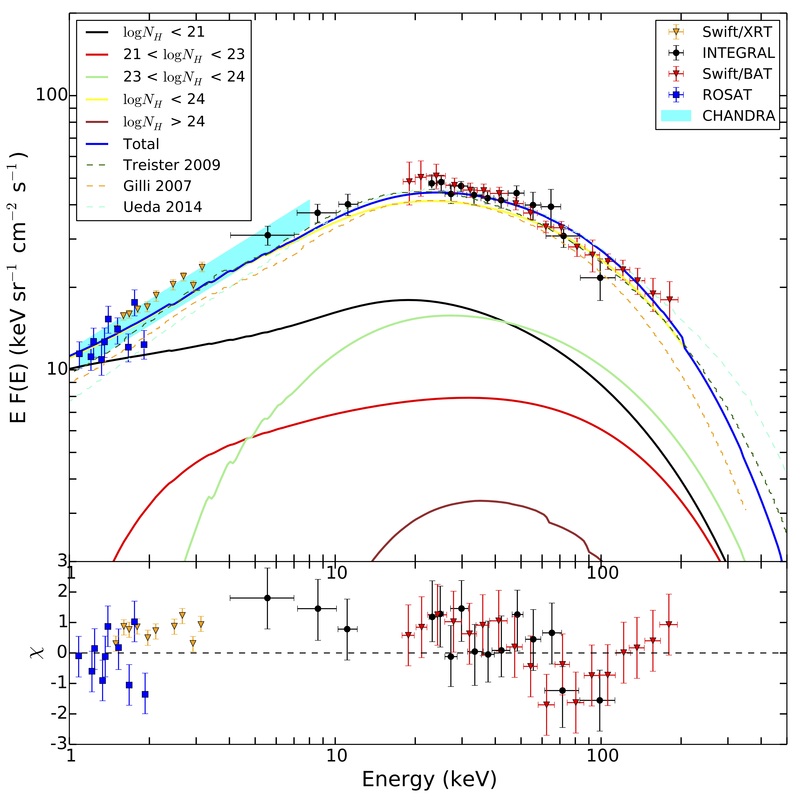 The green curve shows the strong contribution from midly obscured Active Galactic Nuclei. The brown curve shows the limited contribution from Compton thick sources.